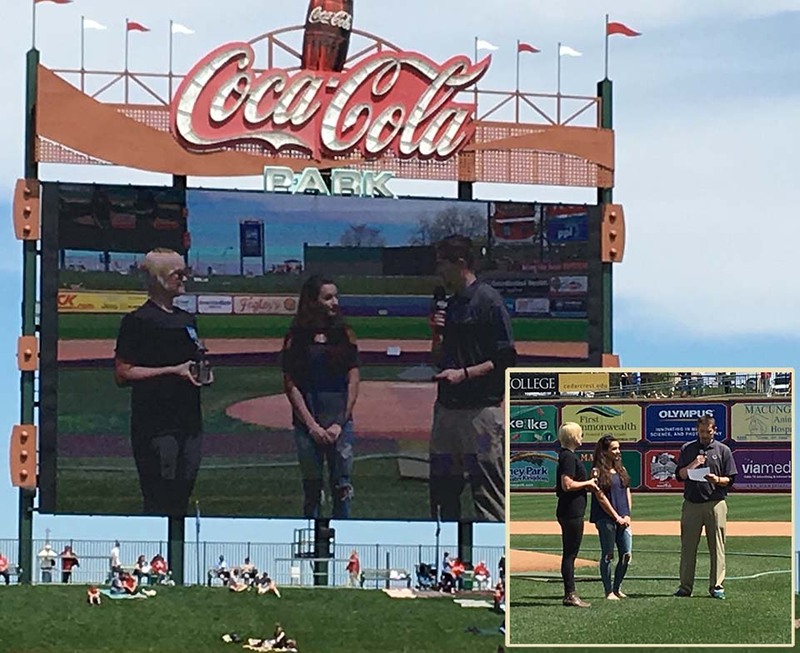 At the IronPigs game on April 23, 2017 Abbey Heimbach and Joe Salas were honored with the Community Star Award. The following is the narative that was read to the IronPigs fans by Kurt Landis. “Joe and Abbey are Seniors at Easton Area High School and outstanding representatives of the youth of our community. Their volunteer work with the Miracle League of Northampton County is a shining example of the best of our students in the Lehigh Valley have to offer. When you see a Miracle League game for the first time you will be amazed by what you see. Special needs children of all ages and abilities playing the game of baseball. Running, walking and wheeling around the field, hitting a baseball for the first time. The smiles on the players faces tell you that you are truly witnessing something special. At the heart of this experience are our volunteers, and at the heart of our volunteers are Joe Salas and Abbey Heimbach. Joe and Abbeys signature are all over what we do. They can be witnessed being buddies with our kids needing the most attention, putting them at ease with their confidence and calm demeanor. They can be seen be running the scoreboard, announcing a game, coaching a team or flipping hamburgers. They organize other groups of students to volunteer and put in hours and hours of volunteer time doing whatever they can to make The Miracle League Experience the best it can be for our very special players and their families. That, ladies and gentlemen, is a true Community Star. The MLNC family congratulates and is very proud of Abbey and Joe as recipients of this award.